Delta Scape: What did you see/hear? A place to write my way to understanding about issues related to teaching and learning. (Because of my experience, my focus is on mathematics education.) Please join me as I explore the changing educational landscape. How do you teach problem solving? How can coaching improve teaching and learning? Last week, I attended the Michigan Reading Association's Annual Conference where I went to a session lead by Doug Fisher. He was presenting on Response to Intervention from a gradual release of responsibility perspective. 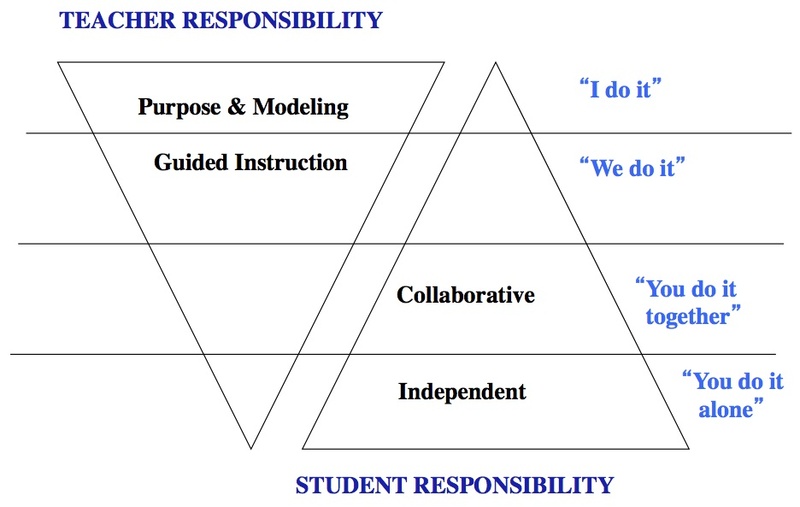 It was the gradual release model that I was most interested in - especially since his book with Nancy Frey presents a slightly different version of this approach than the one I use. But I will leave that discussion for a later post. Today, I want to share my current thinking about what makes for an effective demonstration lesson (what Doug labels Purpose & Modeling). The demonstration I am sharing comes from a workshop for my Teaching and Learning Middle Grades Mathematics [TLMGM] course (a combination content and methods course that our secondary majors take prior to student teaching). This workshop focuses on comprehending the purpose behind a lesson that a teacher might encounter in an unfamiliar curriculum. Many of our student teachers find themselves using curricula that typically require a significant amount of professional development. Because our student teachers have not had this support, they sometime struggle to implement the lessons effectively. Therefore, I hope to share an approach I might use to better understand the rationale behind a lesson. I used the ShowMe App to take a picture of a number string from a lesson found in the Context for Learning Mathematics series and then added my thinking. ShowMe records both my whiteboard annotations and voice to create a video that I can share with others. A key piece to any demonstration is the debriefing: What did you see and what did you hear? This reflects Cambourne's perspective on who is ultimately responsible for learning: "Learners need to make their own decisions about when, how, and what 'bits' of information to learn in any learning task." By asking the learners what bits of information they attended to during the demonstration, the teacher is gathering important data that can inform future instruction (formative assessment). If the observers did not attend to something important presented in the demonstration, the teacher can highlight the missing points by saying, "I noticed that I was also..." The resulting list provides an anchor chart that learners can refer back to as they take more responsibility for employing the approach. analyzing my options before jumping into any plan. Satisfied that they had attended to the major points of the demonstration, I provided them with further resources related to the Ratio Table unit and had them work collaboratively. They tried to look at the strings from the various angles in order to understand the purpose of the lessons. Reflecting back on this post, I have come to realize that if I were going to embrace the idea of "flipping" my class, this is what it would look like. I would use ShowMe to create demonstration lessons and have my learners watch them. When they finished, I would ask them to Tweet those things that they noticed in order to assess what they paid attention to and create an anchor chart for the class. I know that my learners (college students) may differ from your's if you teach in a K12 school. But what do you think? Would this work for you? When is it okay to use a calculator? How would you describe someone successful at math? How do you play Bi-N-Bi? How do we make thinking visible? 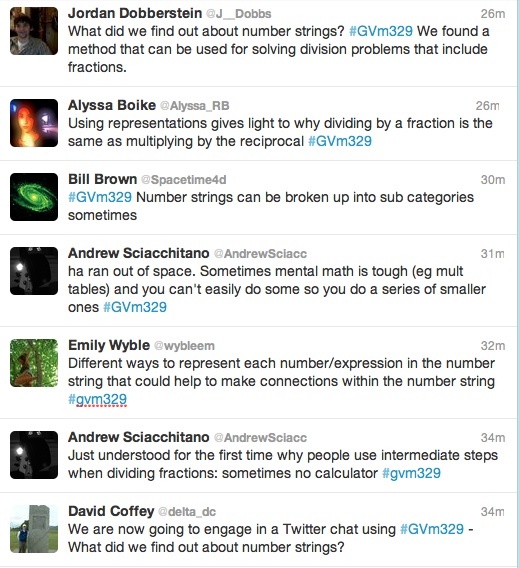 I am a professor in the Mathematics Department at Grand Valley State University. Mostly, I teach future teachers but I also do some professional development with inservice middle school teachers. My six-word teaching philosophy is: "Agency and capacity fostering sustainable learning." My wife, Kathy, is a first grade teacher. She is the person who keeps me grounded in educational reality when I begin to get too idealistic. I have also learned a great deal from her about comprehension strategies and instructional coaching. I have three adult step-children (Hilary, John, and Andrew).